Avalon Rafts has a long and treasured history. 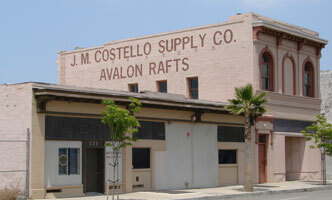 Avalon Rafts is a family owned business with roots in California dating back to the nineteenth century. The following is a brief history of Avalon Rafts by David J. Costello, grandson of J.M. Costello, founder of the original company on this site, who’s name is still proudly displayed on our building. My Grandfather was born in 1898 in Cambria, California in a kitchen of a little shack on a farm. At age 11 he left his home and went to sea. By age 20 he had 3 engineers license’s and was traveling up and down the Pacific coast. In 1939 he bought the property we are located at now and in company with a few other men started a ship chandlery named J.M. Costello Supply. After a few years he bought out his investors and was on his own. In 1965 when it became mandatory to have life rafts onboard U.S. Flagged vessels he started servicing Switlik life rafts in the basement down stairs. My Father started working in the basement servicing life rafts in 1969. In 1980 we were approached by Beaufort Canada to service life rafts of the Princess Cruise ships. We had open space up stairs from the basement raft room and Avalon Rafts Sales & Service was opened in 1981. Since then we have grown to over 21 manufacturers strong and still growing. Avalon Rafts sells and services most major manufacturers of life rafts, inflatable boats and marine safety equipment. We carry a complete line of life rafts, dinghies and inflatable boats. We are an authorized dealer and major warranty repair facility for Achilles, Avon, AB Inflatable, Ribcraft and Zodiac. Avalon rafts is approved by United States Coast Guard, SOLAS, RINA, LLOYDS, ABS and DNV. If you are looking for life rafts or marine safety equipment for recreational pleasure craft, commercial marine, aviation emergency water gear or military vessel buoy life rafts, we at Avalon Rafts are willing and eager to help. We also offer life raft and inflatable rentals for commercial or leisure use. We have a proud tradition of excellence in the marine safety field. Our standards are of the highest order and we take our work very seriously. Our trained professional staff is ready and eager to help you select the proper solution for your individual or company marine safety requirements.